A month ago I started a topic about a MeFoto travel tripod sale at B&H. I bought one and few others here did too. The MeFoto line has three versions going from lightest to heaviest, Backpacker, RoadTrip and Globetrotter. This morning, the heavier duty Globetrotter version is on sale. The catch is you have to buy a bright color! The black ones are $159. The colored versions are $50. The only difference is color. I was more than pleased with the red Roadtrip for my M4/3 and smaller cameras. The Globetrotter should be well suited for those that travel with a full frame mirrorless or DSLR. I'm not a fan of MeFoto. A friend of mine that's new to photography bought a new camera from Sammy's Camera and they sold him a MeFoto tripod. He brought all his goods over to my house so that he could show it off and all was good except for the tripod. The camera was a Canon 80D. We drove back over to Sammy's and I said to the sales guy that I didn't think that the MeFoto was a good choice and that I'd like to see his Manfrotto tripods. He took one look a the MeFoto tripod and asked, "who sold this to you"? The sales person wasn't there, so we moved on to other Manfrotto tripods and ball heads. Even the more experienced sales person, one that is a member of the same photo club that I belong to, didn't think that the MeFoto was a very good tripod. They are too lightweight and unsteady. But if the one you have works for you then that's awesome. I've been with someone on a dark night doing star trails and her MeFoto literally fell apart and wouldn't hold her camera. I have two MeFOTO pods: a DayTrip small to mid-size tripod that can specialize in low angle shots and one of their Walkabout monopods. Neither are robust and might not be suitable for some DSLRs with larger zoom lenses, but when set up properly they both work quite well with my Fujifilm X-T2 DSLR-style mirrorless camera and my mid-weight X100F compact. “Horses for courses”, as the phrase goes. "....so we moved on to other Manfrotto tripods and ball heads." You might be missing the point. This is not about the "best". 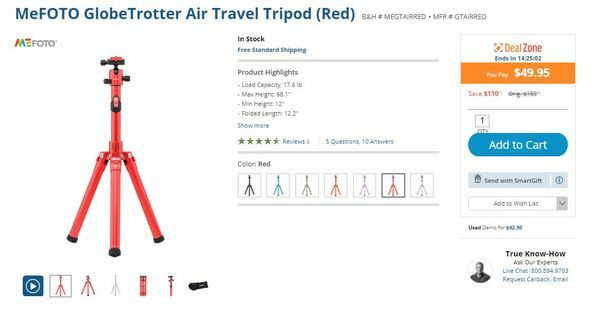 It is about pretty damn good for people that might need a $50 tripod, especially for travel. I understand you. I'm just pointing out that it just may be a waste of $50. If it falls apart the first time you use it, or if your camera falls over the first time you use it because it's not designed to support a DSLR, then . . . . I don't know. I just think it's more wise to spend a little more money and get something that is going to last rather than buy something cheap, two or three times and in the end buy the more expensive stuff. I've been there and done that. I'm not kidding when I saw one fall apart the first time this acquaintance brought a new MeFoto with her to Joshua Tree to do Milky Way and Star Trail photos with me and some club members. I'm also not kidding about that friend that returned his $50 MeFoto and the sales guy that's worked for Sammy's Photo for many years said "which sales person sold this POS to you?" There's more to it than just that, but my friend let the sales person pick a tripod for him since he knew nothing about them. I'm not saying that Manfrotto is the only good tripods on the market. Some Induro, most if not all Gitzo tripods, and most Manfrotto's are good along with others that even cost more. IMHO it's not a good thing to go cheap on a tripod. Just like it's not smart to go cheap on light stands.